Why do I blog as CityEconomist? Because I can tell within hours whether I have hit on a good topic and posted something that is interesting. In that case the number of people who look at the post rises from a fairly immediate 2-10 to 20 or 30. If the views stop there, the topic is clearly of limited interest to the CityEconomist audience (you). But on a good day the views will rise quickly to 100 and keep going. Sometimes they will keep climbing for days, even months. I don't know who is reading my posts unless you sign up for Google + (or some other feed that notifies me), but it is enough to know that the posts are being read. Thank you. So I blog for... feedback. FYI, here are the most-read posts, in order of readership, as of 100 posts ago (it takes time for a post to accumulate readers). Four of the posts have had more than 1,000 views. I was in Washington working for the Joint Economic Committee between April 2009 and May 2011, which explains why there are no posts during that period. It is easy to get to them via Google - just type "CityEconomist" and some of the listed key words. The date will also take you to the post on www.cityeconomist.blogspot.com. Thank you for reading! Please comment or send me an email at john@cityeconomist.com. Postscript, March 9, 2016: G+1 counter (all of my blogs) just clicked past One Million Views. How the Clinton Health Care Plan Was Killed AlterNet, American Prospect, Barack Obama, Ezra Klein, Fritz Hollings, Health Care Reform, Office of Management and Budget, Peter Orszag, Ron Wyden. at Fraunces Tavern in New York City, December 1783. 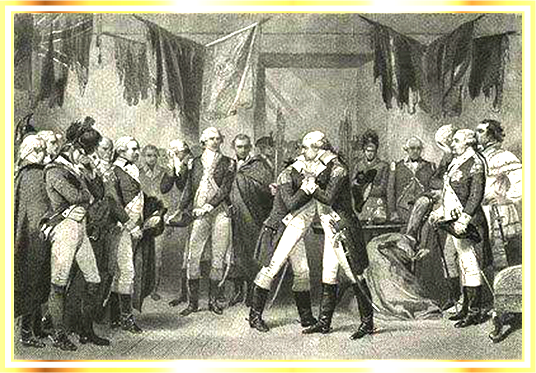 On this date in 1783, General George Washington tearfully said goodbye to his officers in the Long Room at Fraunces Tavern, 54 Pearl Street (at Broad), New York City. The tavern now encompasses a museum. Washington was described as so overcome with emotion that he was barely able to speak. The context was that the British soldiers left New York City two weeks before. This was the final victory, more than two years after the redcoats surrendered at Yorktown, Virginia. In the meantime the under-supplied and overworked Continental Army had narrowly survived several mutinies and, the autumn before, a near-coup. The second Treaty of Paris, between Britain and the newly independent American colonies, was not signed until September 3, 1783 -- 20 years after the first Treaty of Paris, signed between the British and the French, wound up the French and Indian Wars and made the independence of the colonies possible. Following the signing of the Treaty of Paris by representatives of the American colonies, General Washington resigned as commander in chief of the Continental Army and retired to his home -- Mount Vernon, Virginia. Washington's return to civilian life was significant. It said to history -- this was not just a war, it was a revolution. The Continental Congress had given him dictatorial powers. Some wanted Washington to become king. But he did not want this. He wanted a Republic, and land in the western territories for his veteran officers. Washington's farewells to the nation and to his officers were short-lived. Five years later he was elected as the first President of the United States. Life of Walker by Walsh. 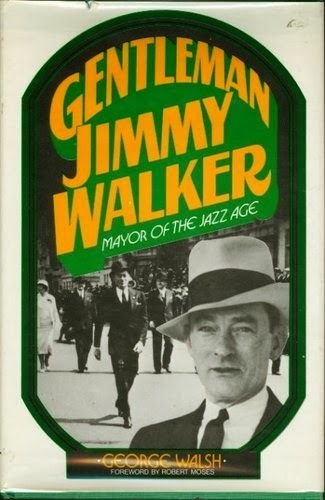 NYC Mayor William H. ("Jimmy") Walker (1926-32) died this day in 1946 at 65. He was installed by Tammany Hall and did well for a few years, overhauling the Sanitation Department. But he became enamored of being the "Mayor of the Jazz Age" and being called "Gentleman Jimmy", and became known for spending a lot of time at the speakeasies. When the stock market crashed during his first term, Cardinal Archbishop Patrick Hayes pronounced the cause as Mayor Walker and his permitting of casinos and girlie magazines. Al Smith (Governor, 1923-28) supported Walker, who was reelected in 1929, but FDR (Governor 1929-32), with his eye on the presidency, was less forgiving. In the end, a corruption scandal (pay-to-play by municipal contractors) blew up and Walker resigned. Larry King, born Lawrence Harvey Zeiger in 1933, King is the son of immigrants who ran a Brooklyn bar & grill. He got his start with a Miami radio station and for many years ran a hugely successful interview and call-in show. Now 80 years old, he "hung up his suspenders" at CNN but continues to appear on a variety of shows. To see what a health care website landing page should look like, visit The Health Sherpa. It's like Google – a clear, uncluttered place to start your research. Type in your zip code. The health care website is meant for people who don't have insurance. They are likely to be young and stretched for the money to pay premiums. Many are likely to be below-average in computer-savviness or familiarity with bureaucracy. So the site should be super-simple. We know what we actually have been given by the national system and many state systems -- a nest of options, slow response times ending with no response at all. This being the USA, however, three people have created thehealthsherpa.com to provide simple access to what people need to know, which is the availability of options in their area. Unfortunately, thehealthsherpa.com doesn't yet have access to the NY State data (see below) so the site doesn't work yet for us in this state. A possible danger with independent sites that offer better access to healthcare data than existing exchanges is that scammers are operating in the same space. A sample story is that of a self-proclaimed good Samaritan who charged a baffled health insurance searcher $100 and then walked off with the person's Social Security number, bank information etc. Consumers should be warned not to provide sensitive personal data until they are sure they are on an official site. Meanwhile, here is what I got when I went to thehealthsherpa.com and gave them my NYC zip code. New York has their own healthcare exchange, and hasn't shared that data with us yet. We are working around the clock to import their data from state records. If you'd like to be notified when we add NY plans, you can sign up for our email list below. In the meantime, you can find and compare plans on New York's exchange. 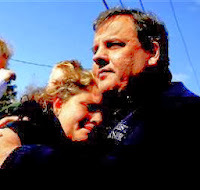 Governor of NJ comforts Sandy victim. During my half-year stint as Chief Economist at the New Jersey Institute for Social Justice in Newark, I wrote a report tracking the payout of the public and private funds set aside for victims of Sandy. Sandy caused damage equal to 5.8 percent of the NJ economy (gross product), more than twice its 2.8 percent share of the New York economy. The report showed, overall, that the hardest-hit were the poor and near-poor, who were under-insured and under-prepared for the storm. If they had assets, they lost a major part of them. If they did not have assets, they died or suffered trying to stay alive. In my report I compared New Jersey's response to that of New York. Most of the comparisons were not favorable to New Jersey, which was slower to pay out money to victims and was less transparent about how donations and Federal aid was being spent. In June I moved on to serve as chief economist to the Warrior Family Foundation. [Last month New Jersey] had distributed only about a quarter of the $1.2 billion that the federal government had awarded to help New Jersey homeowners and renters recover from the storm. [In addition, there were] complaints about heavy bureaucracy and a lack of transparency. State officials responded that] the federal housing department required several layers of additional approval... to prevent the kind of fraud that followed Hurricane Katrina. Rep. Carolyn Maloney (D-NYC) gets her pen after Pres. Obama signs the law she introduced, the CARD Act. Man bites dog. The NY Times Business Section highlights a Chicago School economist who set out on a routine debunking of credit-card regulation and along the way decided the data show the opposite. He meant to show the law did not benefit consumers... and found that it actually did benefit them. In fact the law was a $20.8 billion gift of lower fees to credit-card holders, not just in 2010 but every year. Credit-card users are paying $20.8 billion less per year, just because of the law, concludes Prof. Neale Mahoney, along with his three NBER co-authors -- Sumit Agarwal, Souphala Chomsisengphet and Johannes Stroebel -- the last of whom is a professor at NYU Stern School. But where did this law come from? The Credit Card Accountability Responsibility and Disclosure (CARD) Act resulted from a long struggle. Surprisingly for a newspaper published in New York City, Floyd Norris does not mention that the law was introduced by New York City's Congresswoman from the Silk Stocking District, Rep. Carolyn B. Maloney, and was supported by then-Senator Barack Obama on the Senate side. Maloney first introduced the bill as the Credit Cardholders' Bill of Rights in the 110th Congress (H.R. 5244) when she chaired the House Financial Services Committee's Subcommittee on Financial Institutions and Consumer Credit. The bill passed 312-112 in the House. Although Sen. Obama supported the bill, it was not voted on in the Senate. Maloney reintroduced the bill in the 111th Congress (H.R. 627), during which she chaired the Joint Economic Committee. On April 30, 2009, the House passed the bill 357-70, the Senate passed an amended version on May 19, 90-5, and the House passed the amended bill May 20, 279-147. 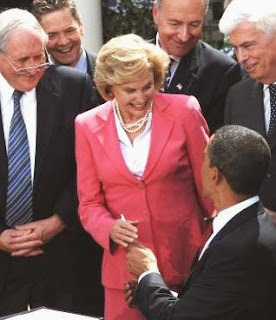 The bill was signed by President Obama on May 22 at a White House ceremony at which he acknowledged Maloney's key role in it by putting her right behind him when he signed the bill and bestowed on her a pen and a kiss. The law went into effect February 22, 2010. 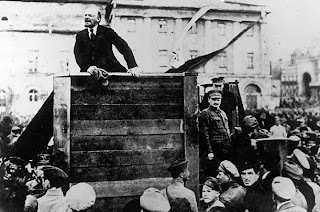 Lenin, a few days before the October Revolution, 1917. On this day in 1917 -- which was October 25 in the old Russian calendar, so it is called the October Revolution in Russia -- Bolshevik partisans in Petrograd overthrew the provisional government under Alexander Kerensky. Petrograd was the new name since 1914 of St. Petersburg. The name was changed to Leningrad in 1924 and back to St. Petersburg in 1991 after the dissolution of the Soviet Empire. Kerensky's interim government, ruling Russia since February 1917, had been authorized by Czar Nicholas II. The Bolsheviks under Lenin formed a new government that would become the Union of Soviet Socialist Republics until 1990. Czar Nicholas II and his family, the Romanovs, had ruled Russia for 300 years. Russia included more than 150 million people and one-sixth of the earth's land. But workers had been restless for decades, back at least to 1825 when 3,000 soldiers rebelled on behalf of greater equality and freeing the serfs. This Decembrist revolt was suppressed by Nicholas I, but its ideals of equality of freedom for serfs endured. In 1905, Nicholas II agreed to reforms. World War I devastated Russia. Hyper-inflation occurred. Russian casualties during the war were the highest of any nation ever in any war. In March 1917, riots broke out and Nicholas II abdicated, with Kerensky forming a government. That created a vacuum. Vladimir Lenin saw his opportunity and returned to Russia after a decade in exile in Switzerland. With the slogan "Peace, land, and bread!" he gained popular support for his Bolshevik ("Majority") Party, which grew from 24,000 to 200,000 members. Bolshevik Party leaders agreed that the time was right for an armed uprising. They made their headquarters at the Smolny Institute, which was created as a school for girls from wealthy families. In "Red October" (November 7 in the Western calendar), Bolsheviks took over post offices, bridges, train stations, government organizations, and the state bank without a single shot being fired. People were ready for a change, and most of the Russian armed forces were fighting in the trenches. At 2 a.m. the next morning, the cruiser Aurora fired a blank shell at the Czar's Winter Palace in Petrograd, to signal that it was time to attack it. The revolutionaries found a few members of the provisional government there and arrested them. The coup was bloodless and undramatic. Soviet propaganda later changed many facts to make it look more heroic. Although the Bolshevik Revolution was formed as a democratic overthrow of a despotic czar, it was itself despotic. Lenin's successor Stalin is widely believed to have killed 12 million of his own people to maintain his power and ensure the collectivization of farms in the teeth of resistance by independent farmers, the kulaks. The Bolsheviks were more successful than the Decembrists at creating equality, but they did it not so much by raising the lowest individual incomes as eliminating independent entrepreneurs who were the key to initiative and responsiveness to markets. When Mikhail Gorbachev came to power, he saw that the be competitive in world markets, Russians needed to be more open (glasnost') and market-oriented (perestroika). As he succeeded in these goals, Russians decided that Communist Party controls needed to be loosened. This process led to the dissolution of the Soviet Federation. I recently posted something critical of the Board of Elections. I don't take any of that back, but I do like the idea of getting an "I Voted" sticker when I left my polling place yesterday. It helped offset the fact that the polling place is four blocks south of where I live, and it has been switching between locations that are a block apart. I went initially to the old location. As I was leaving, having voted, a young woman on her way in marveled at the paper ballots and said: "Most people here have iPhones, and we still are using paper ballots?" Back to the sticker -- it would have been even more appreciated if it was accompanied by a coupon for a pint or scoop of ice cream from Ben & Jerry's, or something like that. Ben and Jerry and other companies have done that for people dropping off their tax returns at the General Post Office on April 15. JOBS | Are Older Workers Keeping Jobs from Younger Ones? 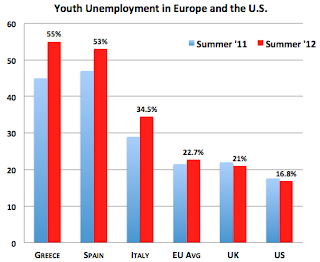 USA suffers from 17% youth unemployment. Before she discovered that the United States was tapping her phone and emails, German Chancellor Angela Merkel rated youth unemployment as "the biggest crisis facing Europe." In Britain nearly one million young people are jobless. The talk in the UK is of a "lost generation" of workers, as lack of jobs creates mental-health problems in this age cohort. The nonprofit MindFull says that 850,000 UK children, one-third of the age group, suffers from a mental-health problems and many more suffer from anxiety and depression. Mental-health problems represent the largest single cause of disability in the UK, 23 percent of the NHS burden. Yet the NHS is spending only 1 percent of its budget addressing the causes of mental health problems, according to a member of Parliament, Nicky Morgan. 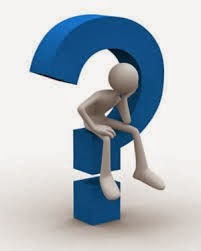 The main concerns of young people in the UK are school stresses (54 percent), worrying about the future (53 percent), and feeling inadequate (52 percent). 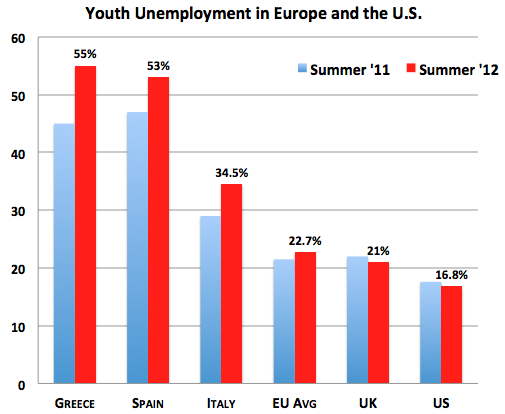 Like Europe, the United States has high unemployment among its young people. At the same time, with the asset meltdown in 2008, baby boomers who expected to retire at 60 or 62 have stayed on to keep working past 65. They can't afford to retire. The United States ranks third in the world for hiring over-65 workers, after Japan and Singapore. There is no maximum age for retirement, although specific jobs have age limits, like some judges in New York State. The persistence of older workers in their jobs has been cited as a reason for high unemployment among youth. Some employers are concerned about the lack of intake of younger people and offer "buyout" arrangements – for example, extra credit toward retirement – to encourage elderly workers to retire so that more younger workers can be recruited. But is the retaining of older workers really the reason for high unemployment of younger workers? According to a study cited by the UK Parliament, there is no evidence that older workers who stay on the job longer squeeze out opportunities for younger employees. The study by the Center for Retirement Research (CRR) at Boston College says that there may be situations where older employees crowd out younger workers in some companies or areas, but not across the workforce at large. The report examined employment and unemployment rates, wages, and hours worked in all 50 states over time (1977-2011) for three different age groups: 20-24 ("young"), 25-54 ("prime-aged"), and 55-64 ("old"). There was a wide variation among the states in all measures. If older workers were hampering the prospects of younger ones, states with higher employment or wages among older workers would also lead to higher unemployment or lower wages among younger workers. But it wasn't so. No support for the idea that the Recession changed the relative opportunities for younger and older workers. Evidence that the Great Recession did affect overall unemployment rates and wages, but no support for the idea that employment among older workers affected opportunities for younger workers. Employment among younger workers was instead influenced by their education and skill levels, and by whether these workers were employed in the service or manufacturing industries. Younger workers may have needed to migrate to job opportunities in new locations or industries, particularly as the Great Recession ended many manufacturing jobs. Reduces the burden on pension systems, many of which are underfunded. Makes it more likely that consumption and therefore the economy will remain strong. Helps retain jobs that would be lost if older people who are successful at what they do and know how to serve their customers stop working. Enables entrepreneurial older people to generate ideas that result in hiring of more young people as trainees and partners. Workers at the two ends of the age spectrum are not substitutes, they are complements. GOTV volunteers for Bill de Blasio making phone calls from NY State Sen.
Brad Hoylman's Office at 14th St. and 8th Ave. Photo by JT Marlin. Political upsets are most likely to occur in races where the turnout is low and one side has a better GOTV operation. GOTV is both the first and the last phase of all political campaigns. - generate a list of people to call on election day, to remind them to vote and offer a lift to the polls. The first volunteer-led computer database for a presidential campaign was I believe by the Gary Hart techies in 1987-88. I contributed my own Kaypro to the effort and I wrote an article on the innovative campaign for a local newspaper. If anyone who reads this is interested, I will be glad to hunt down the article. In the final GOTV phase, the fundraising and volunteers are in place and the main remaining task is to remind people to vote and either take them to the polls or obtain commitments from them that they will go there on their own. In the New York City mayoral election, what has been happening this past weekend is the culmination of the GOTV effort, namely getting commitments to vote and reminding people to vote. The Get-Out-The-Vote effort has an important side benefit for pollsters in helping to ensure that their predictions are accurate. Pollsters ask respondents questions to determine both "How likely are you to vote?" and "How likely are you to vote for Bill de Blasio?" and they weight responses accordingly. The more likely a respondent is to vote, and the more certain the respondent is that he-she will vote for de Blasio, the more confident the pollster is in the results. But in the end, the voter has to make it a priority to vote on election day, and without a strong internal conscience or an external reminder, an election that is expected to have a small turnout could end up being a tossup. Penn South for de Blasio et al..
Mary Duggan and I were sent up to a building in Penn South, where I discovered for the first time after living in the neighborhood for 42 years that some of the numbers on the Penn South buildings are based on their position on the cross streets and others on their position Eighth or Ninth Avenue. That's why 280 Ninth is north, not south, of 365 (which is on Ninth, but takes its address from the nearest cross street). The building we were assigned to has eight apartments per floor. About half of the apartments were designated pro-deBlasio based on prior phone calls. The landslide Democratic primary victory for de Blasio was organized almost totally from Brooklyn headquarters because the Manhattan clubs were working for Quinn, Thompson or (in the case of the Village Independent Democrats) Liu. On each floor, at least one person answered the doorbell. In the other cases, we left literature promoting de Blasio for Mayor, Letitia James for Public Advocate, Scott Stringer for Comptroller and Gale Brewer for Manhattan Borough President. Someone already seems to have left literature on de Blasio in the building, but a second flyer lets the occupants know that they were visited again. At the end of the building canvass, we had a few names of additional people who might be volunteers, and some commitments to vote on Tuesday. I brought back the detailed report on our canvass for use in phone calling on the day of the election. I volunteered to canvass the building where I live if the de Blasio campaign is able to get to me the same information that we were given for the Penn South canvass. I just don't want to knock on GOP doors. The other thing I have volunteered to do is observe poll-opening as an official inspector from the local club or the de Blasio campaign on Tuesday morning. This is democracy where the wheels hit the road. Voting - Last-minute donors are buying "stock at 52-week high"
De Blasio and Early Supporters, Brooklyn. Photo by JT Marlin. Crains Insider has an inform-ative story by Andrew Hawkins about real estate developers resignedly writing checks, for the max allowable, to mayoral candidate Bill de Blasio -- even though it is late, one week before the election and de Blasio is a shoo-in with a 45-percentage-point spread between him and Joe Lhota. What impressed me most about the article was a campaign contributor's acknowledging that late giving to a candidate was not buying much, that it was like "buying a stock at its 52-week high", as opposed to important early volunteering and money that paid for de Blasio's advertising campaign. The EMILY in "Emily's List" stands for "Early Money Is Like Yeast." Both labor unions and real estate contributors mostly put their early bets on Christine Quinn or Bill Thompson. Polls as of February showed Quinn ahead three to one, with de Blasio just one percentage point behind Thompson, and I noted that de Blasio had the advantage of incumbency. But then Anthony Weiner shot into first place, showing that enthusiasm for front-runners Quinn and Thompson was weak. So when Weiner's campaign faded, de Blasio's ad featuring Dante Blasio and his Afro provided the boost for de Blasio to take Weiner's place in the lead. After de Blasio won the Democratic primary outright, it became clear that Joe Lhota was battling against a huge spread in the polls. Lhota's attack ad on crime got nothing for him, as de Blasio added five percentage points to his lead. So the campaign cash is now flooding in to de Blasio's campaign. The final debate between de Blasio and Lhota is on Wednesday evening (sandwiched between the anniversary of Sandy on Tuesday and Halloween on Thursday) from 7 to 8 pm on NBC-TV. Based on data released by the Bureau of Labor Statistics this morning, more jobs are being found by male veterans who did not serve in wartime and by male non-veterans. But those who served are not having such luck. Their unemployment rates during the last year have been rising for every period of service. Creating its official (alpha) site at www.warriorfamily.org. Initiating some informational events starting November 14 in New York City. To provide us with feedback and be added to our list of invitees for various events, please contact me at teppermarlin@warriorfamily.org. The good news is that unemployment rates are lower among male vets than the non-veteran population, although (1) this is not true for the youngest vets, the Gulf War II cohort, and (2) some part of the explanation is not such good news, i.e., the portion of veterans whose service-related disabilities have forced them out of the labor force. During the past year, the unemployment rate of wartime male veterans has increased for every period of service. It has declined from 6 percent to 5.1 percent for male veterans of non-wartime service. It has also declined for non-veterans. Source: BLS Household Survey for September 2013, released October 22, 2013. Female veterans below a certain age are faring much better. For those who served in either of the two Gulf War period, their unemployment rates have come down substantially during the past year. 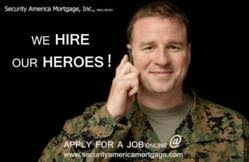 Those who served in Gulf War I are particularly fortunate, with an unemployment rate that fell from 19.9 percent to 11.6 percent. The improvement is also true for women vets who did not serve in wartime, and for non-veterans. 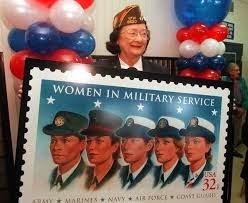 However, older women vets who served in WWII or the Korean or Vietnam wars have not seen the same improvement in their job-seeking success. Their unemployment rate rose slightly.